CareerOneStop has resources for students, and tools to make school counselors’ jobs easier. 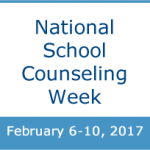 Did you know the week of February 6th is National School Counseling Week? It’s a week to celebrate the impact school counselors can have in helping students achieve school success and plan for a career.